The Sudbury Voluntary and Statutory Partnership for Mental Health (VASP) is dedicated to improving mental health services, and the awareness of them, in Sudbury and the surrounding area. 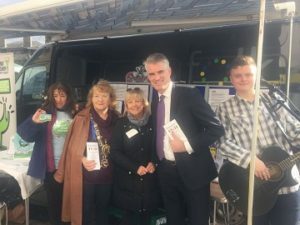 To promote World Mental Health Day (10th Oct), Sudbury VASP organised stands on Market Hill to allow local organisations that deal with mental health and wellbeing issues to provide information and highlight the support that is available to people in Sudbury and the surrounding area. Kernos, one of the key supporters of this initiative, had volunteers manning a stand, alongside other organisations, to help illustrate the range of services that the Centre can offer to people suffering emotional and psychological difficulties. Sudbury’s new Mayor, Cllr Sue Ayers (second left), who has chosen Kernos as one of three local charities that she will be promoting in 2016/7, joined Clinical Director Chris Boatwright (centre) on the stand to show her continued support for the Centre. Also in attendance was South Suffolk MP James Cartlidge (second right), taking time out from his busy schedule to once again demonstrate his active interest in the important work Kernos is doing in this field. Also there were Jane Hatton (far left), from Beat The Street, an initiative run by Intelligent Health in partnership with Suffolk County Council’s Year of Walking to inspire whole communities to get moving, and Ben Smith (far right), a young local musician who busked on behalf of the VASP to help attract people to the stand. Local supermarkets were also supportive – Waitrose donated fruit, while Tesco and Sainburys donated Bags for Life to hand out to visitors.